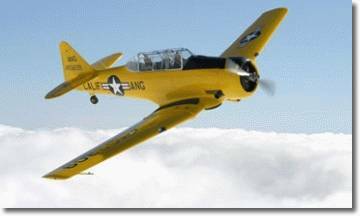 Strictly Flying is now able to offer, in association with WE Aviation, flight experiences in the classic Harvard. This really is a rare opportunity to relish first hand the thrill and excitement of flying in a T-6 'Texan', the famous World War II classic fighter-trainer aircraft. Known widely in the UK as the 'Harvard', this two-place, dual controlled, single engine ex-military trainer is infamous in aviation history, the charismatic growl of her 600 horsepower radial engine evocative of a bygone era. Now you too can discover how so many pilots were taught their flying 'abc's by indulging in a 'flying lesson' in this fantastic historic aeroplane! No previous experience or qualifications are required to savour a nostalgic 30 or 50-minute flight with our fully qualified instructor in this pristine example of a classic warbird. This unique experience lasts for a total of approximately two to three hours depending on the flight duration selected. This includes a full briefing to encompass the all important safety drills, familiarization with the aircraft and her systems and the effects of the aircraft controls. During the course of the flight, the instructor will offer the chance to take control of this wonderful aeroplane and you can experience for yourself the challenges faced by so many young cadets. This is a remarkable chance to enjoy a truly memorable experience at the controls of an aircraft type that helped train over 10,000 British pilots, many going on to fly Spitfires, Hurricanes and Mustangs. Little wonder it was affectionately nicknamed by many as 'the Pilot Maker'. The A-T6 was known as the "Texan" in America and the "Harvard" in the UK and other commonwealth countries. We think that our 'Pilot Maker' was originally constructed in 1943 but, unhappily, her wartime records have long since disappeared. She was 're-manufactured' as a T-6 'G' variant in 1949 and served with various USAF training wings from 1951 until she was 'struck off charge' and sold to the Haitian Air Force in 1954. We are lead to believe that she saw action and was used in anger in an abortive coup in Haiti in the late fifties, probably fitted with wing mounted external machine guns and bomb ordnance in a ground attack role. With her military days over, she was back in the U.S.A. by 1960 where she was owned by a number of civilian enthusiasts before being sold to Paul Morgan and imported into the U.K. in 1990. Paul had her decked out in a classic California Air National Guard colour and markings scheme in the 1990's and she continues resplendent in this genuine insignia to this day.